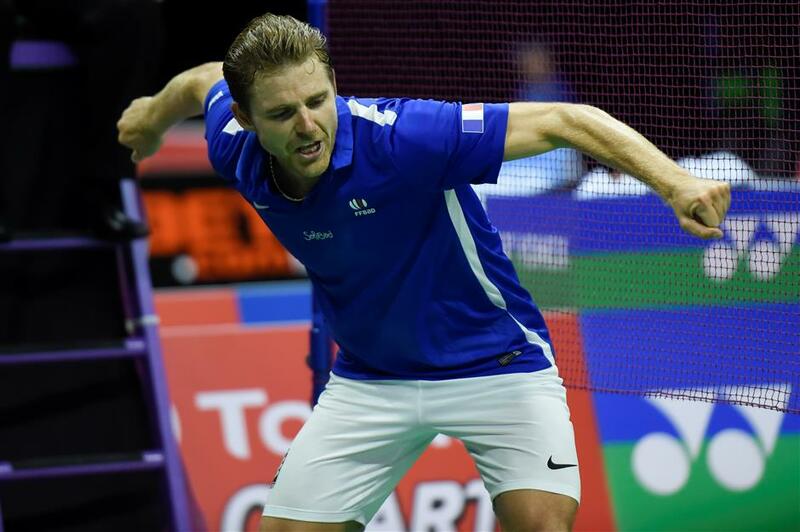 France's Brice Leverdez pulls off the first shock of the badminton world championships by defeating men's second seed Lee Chong Wei in three games in Glasgow on Tuesday. Brice Leverdez celebrates his first-round victory over Malaysia's Lee Chong Wei during the BWF world championships at the Emirates Arena in Glasgow, Scotland, on August 22, 2017. The Frenchman won 21-19, 22-24, 21-17. France's Brice Leverdez pulled off the first shock of the BWF world championships by defeating men's second seed Lee Chong Wei in three games in Glasgow on Tuesday. The 31-year-old claimed the scalp of his career 21-19, 22-24, 21-17 in 75 minutes and perhaps end Lee's elusive search for the world title which has seen him take three silver medals just as he has done in the Olympics. "I'm really happy," he said. "I managed to stay relaxed and played my own game." Leverdez had two match points in the second game — 20-21 and 21-22 — and it was only a successful hawk eye challenge on the second match point that saved Lee from a straight-games exit. In the decider, the 34-year-old Malaysian led 15-10 — but the Frenchman wouldn’t give in. "I knew I was in trouble, but I never gave up," said Leverdez. For Lee, who had a 7-1 record against Leverdez, it was another chance gone. "I tried my best and he got lucky on a few points," said Lee, whose fourth win at the All-England Open this year suggested he was still capable of ending his world title drought. Also winning yesterday was India's 15th seed Sai Praneeth, who edged Wei Nan of China's Hong Kong 21-18 21-17 while women's 9th seed Chen Yufei of China eased past Pai Yu-po of Chinese Taipei 21-13 21-14 in the second round. In fact all 16 women's seeds received byes into the second round, including Olympic and two-time defending champion Carolina Marin of Spain, and top-seeded Akane Yamaguchi of Japan. No. 1-ranked Tai Tzu-ying is skipping the worlds to play in the World University Games in Chinese Taipei. Also in action among men's seeds on Tuesday are Olympic gold medalist and defending two-time world champion Chen Long of China and Rio Games bronze winner Viktor Axelsen of Denmark. On Monday, Lin Dan got his quest under way for a record sixth world championship with a routine win over local British hope Kieran Merrilees. Lin won 21-15, 21-10 after an 11-1 start. "Normally the first match is not easy, because I need to get myself in a good mindset," Lin said. "I did a lot of practice and preparation, so I need to make this mindset last until the end of the championships." Lin, who will turn 34 in October, was never seriously troubled, but paid the local man a compliment. "He was a strong opponent, and played very well," the Chinese superstar said. "But I'll have to play much better later in the week." Next up for the seventh-seeded Lin is Emil Holst of Denmark, who beat the Chinese superstar at the German Open in March. The other names in the top half of the draw in Glasgow, Scotland, were also relatively untroubled; top-seeded Son Wan-ho, and Kidambi Srikanth of India. Son could become the first South Korean male to win the world championship, but he has to pass the quarterfinals for the first time. He and Kidambi, who beat Son while winning consecutive Superseries titles in Indonesia and Australia in June, are seeded to meet in the quarters. Son beat Finland's Kalle Koljonen 21-14, 21-16 in 44 minutes. "It was my first match and I know all the other players are keen to beat me," said 29-year-old Son, who led South Korea to victory at this year's Sudirman Cup in Jakarta. "I was also needing a chance to get used to the venue. But now I am feeling good. "This is a very important competition for me. It would be a dream to become world champion. But I need to work very hard over the next week."